Designed for general source capture and dry cleanup. 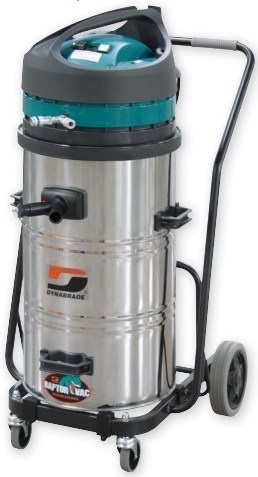 7.8' (238 cm) water static lift; 120 CFM (3,400 L/Min) vacuum flow. Vacuum starts automatically with startup of tool. Bypass Motor System uses environmental air to cool the motor and extend vacuum life. Heavy-duty stainless steel recovery tank, with 20 gallon (78 liter) capacity for clean filter assurance. This size allows filter to remain at substantial distance from collected debris, reducing clogging and extending motor life. Includes HEPA H13 Filter with 99.95 % efficiency on 0.3 micron. Automatic cleaning of filter. By connecting vacuum unit to external air supply, a blast of air is released to filter every 40 seconds of operation, to cyclically clean it. Convenient orange warning light indicates that filter needs replacement. Red warning light indicates protection device has been activated to prevent heat overload to motor. *Models 61415 and 61421 DO NOT include accessory outlet.